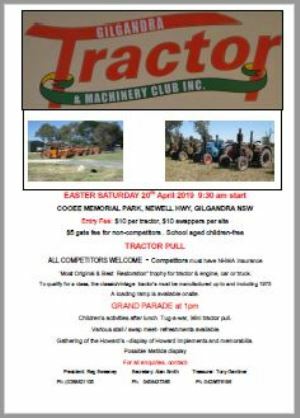 GILGANDRA (NSW), EASTER WEEKEND ... 19th/20th/21st April. 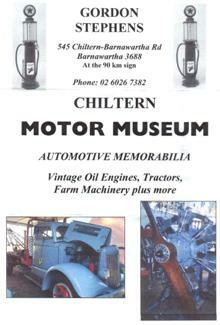 Friday 19th - meet at Gilgandra Historic Machinery Museum, Newell Highway, Gilgandra. We will be having a Meet & Greet (12 noon onwards), as well as a tour of the Museum. After this, (after lunch) we will head down to Machinery Display (about 500 metres) to have a look at things, and set up for Saturday. Saturday 20th - Gilgandra Historic Machinery Display and possibly Swap Meet (8am onwards) on the Newell Hwy. (Southern end...Dubbo...of Gilgandra). Coming from Dubbo you should not miss it. Coming from Coonabarabran, go over bridge and turn left. Coming from North of Gilgandra, just go straight through town and head to Dubbo, about one kilometre on your left. Sunday 21st - visit to 'Mountain View', Biddon... which has been confirmed by owner. (Meet at Museum 10am). There is usually a Speedway Meeting on Saturday night, if not raining. Ring ROBERT MOORE - (02)6845-3279 if you intend Rallying as part of this weekend. From Friday through to Sunday - ring ROBERT - 0458453279 or ANNE 0402809543. ORGANISE YOUR ACCOMMODATION. THERE ARE MANY MOTELS, AS WELL AS CARAVAN PARKS WITH CABINS. 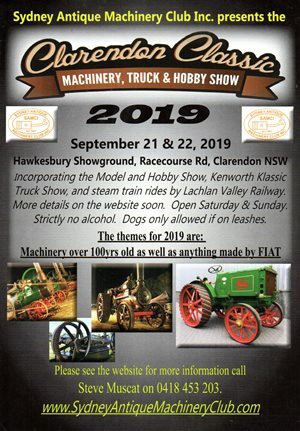 There has been an enquiry by a Register Member, regarding having us as part of the Manilla Machinery Club Display and Swap Meet on the JUNE long weekend. DETAILS will be placed on the website if this display eventuates. --- QUEENSLAND --- QUEENSLAND --- QUEENSLAND --- NOW IT'S YOUR TURN!! We need a large Rally to hold a "Gathering of Howards" in either 2019 or 2020, by an N.H.M.A. Club, for Insurances purposes. Get in contact with me ASAP so I can look at all proposals. We have a get together in August at the Dubbo Truck & Tractor Show, and the Clarenedon Classic in Sydney in Septmeber. SO HOP TO IT, AS WE LOOK FORWARD TO SHOWING IN THE SUNSHINE STATE. Robert -(02) 6845-3279 / 0458 453 279.